I have had this shadow box for about 20 years. It was finished out with a dark country pine stain, no varnish, when I purchased it. The shadow box quickly became a home to my "cutesy country" cows, geese, bunnies, birdhouses, etc. of the early 1990's. 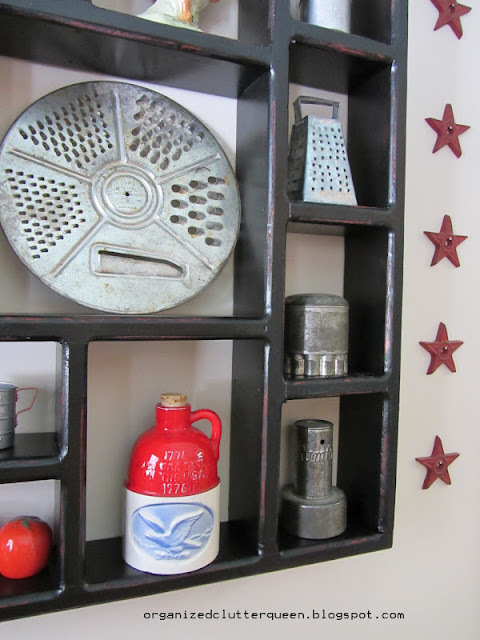 When I went to a vintage country kitchen style, I painted the shadow box red, and antiqued it with a little dark stain. 1776-1976 Bicentennial Souvenir of 1st National Bank of Petersborough and Rumford Biscuit Cutter. 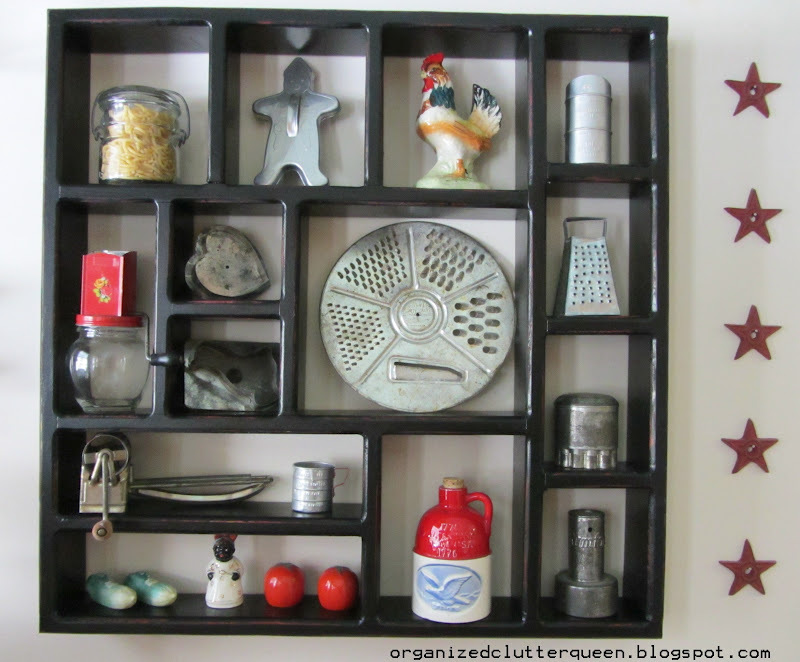 And there it is, a new look for my kitchen shadow box. I liked it red at Christmas but, I really LOVE the black and all your silver items just really set it off!! Very Cute!! It's amazing how the color of paint can change the look of that little shadow box. What a fun collection you have going on in there. I wasn't sure if I liked it better blavk or not for a few days! Nice change and love the collection! It is great in black and shows off your cool collection well. Carlene, I liked your shadow box in red, but I REALLY like it in black. 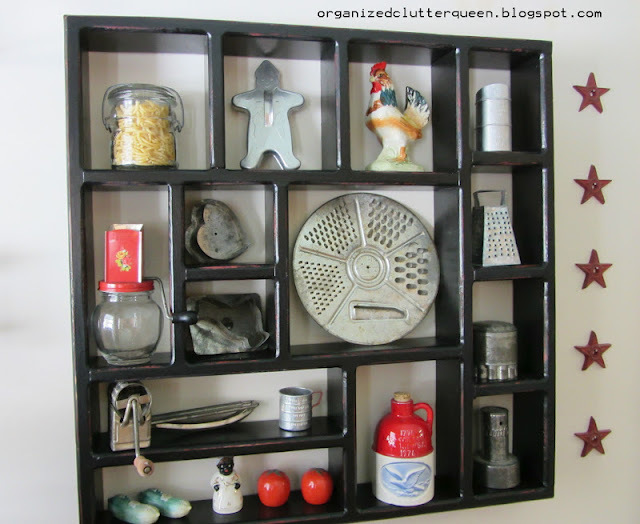 It's a great showcase for your neat vintage cooking pieces. I like the shadow box black too Carlene.. it does contrast much nicer with your collectibles. Looks great! I like the black more than the red. I love it, the black really shows off your items. 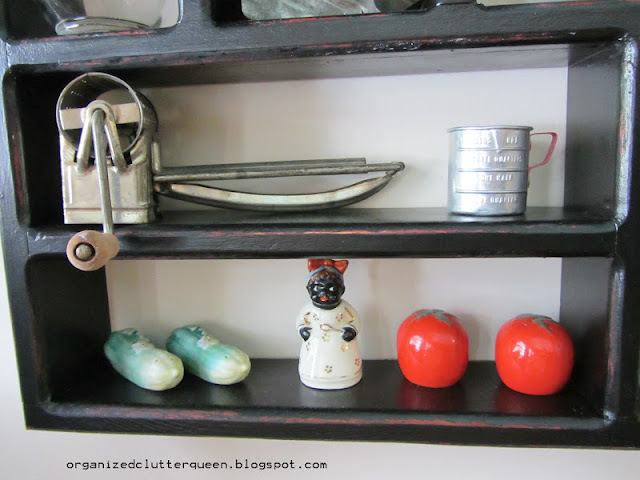 I collect salt and peppers as well, they are just so cute - I need a box like yours to show them off !!! I also display s & p shakers on an old spice rack. 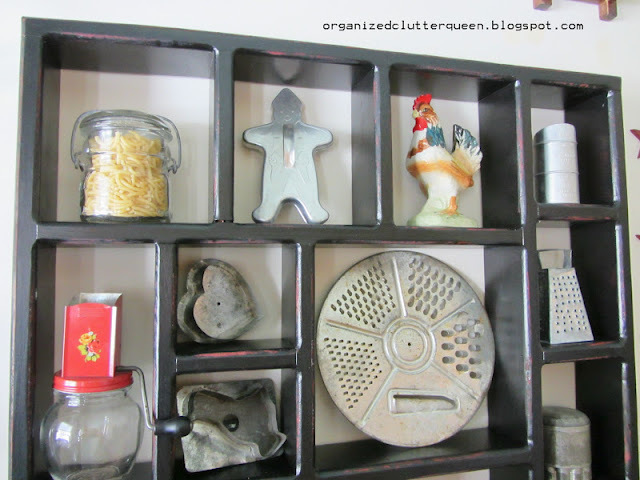 I absolutely cannot believe it...I have the same mini measuring cup from my childhood...I love how you displayed everything!